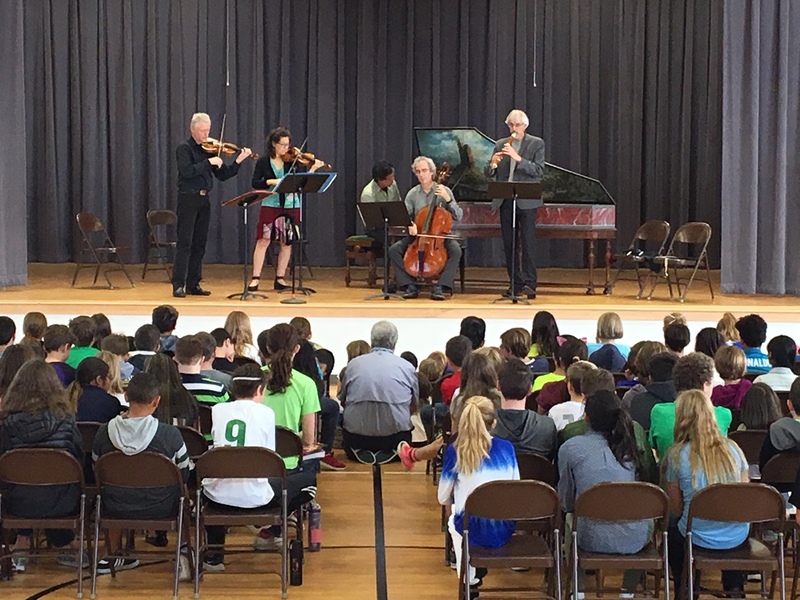 On Monday morning November 13 the students at Judson Montessori School had a delightful treat when the spirited Rebel Baroque group played an informal concert for them. The younger students sat up close on the floor of the gymnasium, while the older students sat in chairs behind them. The students at Judson are very lucky to have as their music teacher, the talented harpsichord builder Gerald Self who generously loaned one of his harpsichords to SACMS for these performances. Many of the students are taught how to play recorder by Mr. Self, and five of them were invited up on the stage to perform a piece by Anthony Holbourne. The Rebel musicians played several works from their Sunday program and interspersed their performances with time out for Q&A. It was also wonderful to hear the individual players play solos on their instruments. Harpsichordist Dongsuk Shin played a beautiful Bach Prelude that wowed the audience, and Matthias Maute played a spry unaccompanied work on recorder.